Philosophy of Care: Accurate and expedient diagnosis and care. Kindness and compassion. Dr. Bhuva received his medical degree from the University of Illinois in Chicago. He completed his residency and fellowship at Rush-Presbyterian St. Luke’s Medical Center. Dr. Bhuva also completed an additional year of Fellowship at the University of Chicago specializing in ERCP’s. Dr. Bhuva has extensive training in hepatology, therapeutic endoscopy and inflammatory bowel disease. He joined the practice in 1997. Dr. Bhuva was born in Glasgow, Scotland. His family moved to the Western suburbs of Chicago soon after. He currently lives in the Barrington area with his wife and three children. 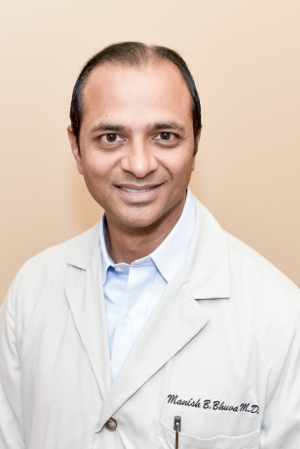 Dr. Bhuva enjoys sports, music, traveling and spending time with his family. Personal philosophy: Dr. Bhuva feels that a patient should be well informed. Explaining disease processes, procedures and specific therapies in layman’s terms helps in making patients feel more comfortable.